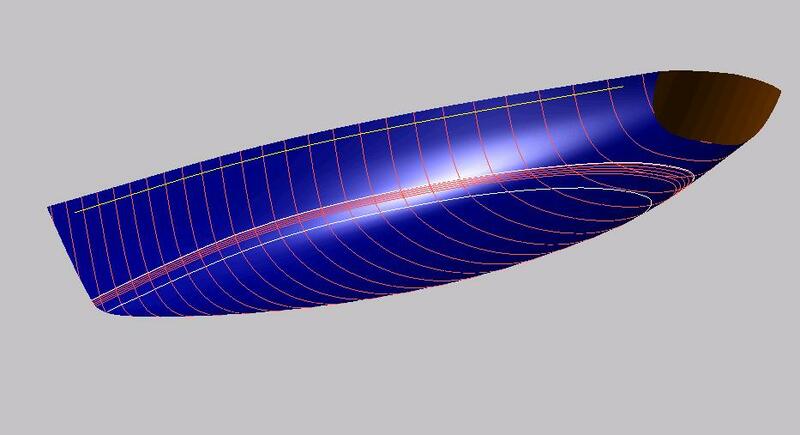 The hull shell is a light weight, high tech ‘wood sandwich’. The inside and outside skins are both carefully optimized laminates of ‘E-glass’ cloth and unidirectionals, combined with epoxy resins and western red cedar veneers, and bonded to a core of 3/4” CoreCell foam. The stem is solid cedar, the stem knuckle is heavily reinforced with additional ‘E-glass’ and wood veneers. 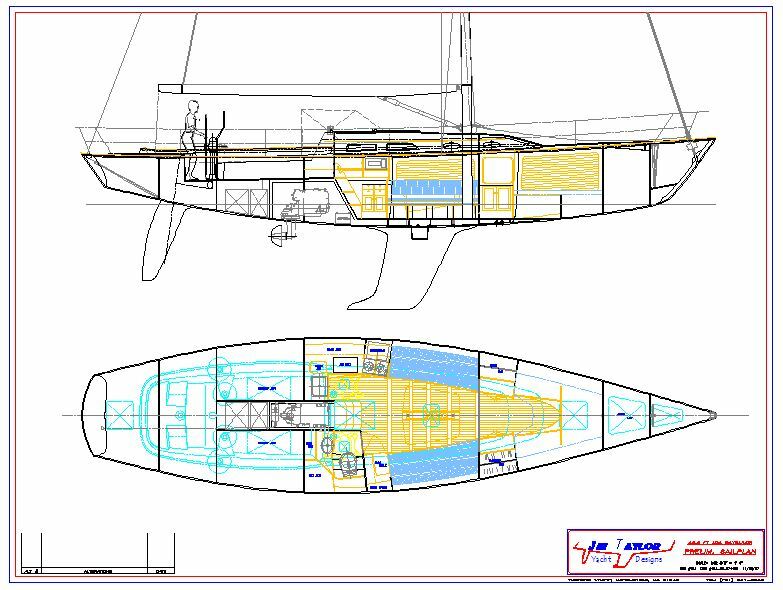 The hull over the keel is solid glass, and there is a ‘belly pan’ of bi-axial ‘E-glass’ over the bottom amidships. The keel loads are further supported and distributed by a sophisticated composite structure of integrated keel floors and longitudinals, all bonded to structural bulkheads and berth faces. The composite chainplates are fabricated of unidirectional carbon fiber, bonded to a locally reinforced area of the inner skin. The interior panels are ‘E-glass’ and foam core composites, bonded with biaxial ‘E-glass’ tape to the adjacent hull and deck surfaces. All of the laminations are vacuum-bagged and post-cured to an elevated temperature that is carefully monitored via thermo-couples and controlled by computer. The deck is an ‘E-Glass’ laminate over varying thicknesses of CoreCell foam. The skins are reinforced and higher density core is used in way of all deck hardware. Unidirectional reinforcements are carefully oriented to resist the heavy compression loads imposed on the deck by the headstay, backstay and mast. Methodical weight control is a high priority throughout, with all moldings and components carefully and individually weighed before assembly. This is a high tech, contemporary design that evokes, but does not just mimic, an earlier era. Above the waterline, the long, graceful overhangs, sweeping sheer, and small counter stern all reflect a focus on classic style. At the same time, below the waterline and above the sheerline, the focus is on performance, with hull, rig, and appendage detailing that has been carefully developed over long experience on the race course. 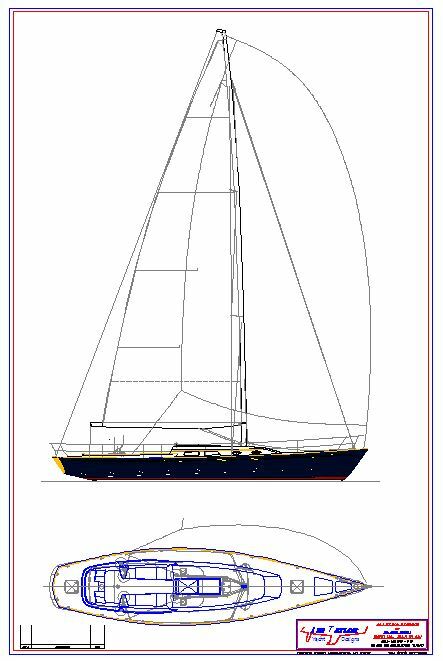 The light weight construction allows a high ballast/displacement ratio, and combined with a carbon rig, it provides ample stability to support a generous sailplan. A self-tacking jib, a ‘socked’ asymmetrical spinnaker, and modern, sophisticated deck hardware (including electric main halyard and main sheet winches) allow a small crew to handle this big power with confidence. The jib furler and backstay adjuster are both located below to keep the deck clear and the look clean. She is intended primarily as a daysailor, so the focus is on an especially roomy and comfortable cockpit. Her interior is intended to be simple and practical, finished in a classic ‘Herreshoff’ style, trimmed with cherry brightwork. Her long sailing length and narrow beam will give her an exquisite meter boat feel, and she will roll upwind like a train without pounding her crew senseless. She will not surf and plane downwind like an ultra-light racer, but she will stretch her long overhang legs in total control off the wind, without spilling the drinks. Her unusual combination of classic style with contemporary performance will set her apart from (and usually far ahead of!) everything else on the water.